I’ve only just realised that tomorrow is a public holiday. Yay for us! I hope you’re having a good week anyway. Also, I am really sorry but there won’t be a Tuesday Stamping post today. I will try to get one done next week but I am a little exhausted and overwhelmed at the moment. Posting every day is hard work! As I mentioned, I chose Descpicable Me 2, so that means yellow and purple minions. For the yellow minions I used 2 coats of Sinful Colors – Pull over and when that was dry I taped the tips and used Sinful Colors – Why not? for the blue. While that was drying I used a black striper to make the ‘straps’ of the goggles. I then used China Glaze – Recycle to make the grey dots for the eyes and then went over that with Sinful Colors – Snow me white. I also used a striper for the mouth. For the purple minions I started with 2 coats of China Glaze – That’s shore bright. When that was completely dry I taped off the tips and used Sinful Colors – Black is black on the tips. I did the same for the eyes part except I used That’s shore bright on the inside of the eye for the purple looking eyes. I also used a purple striper to make a few tufts of purple hair. On my pinky, I started with 2 coats of Sinful Colors – Pull over. When that was dry I used 1 coat of Essence – Only purple matters. I wanted to combine purple glitter with the yellow polish. And that is that. Topcoat everything and y you’re done. The only one here you haven’t seen before is the blue so let me show you. 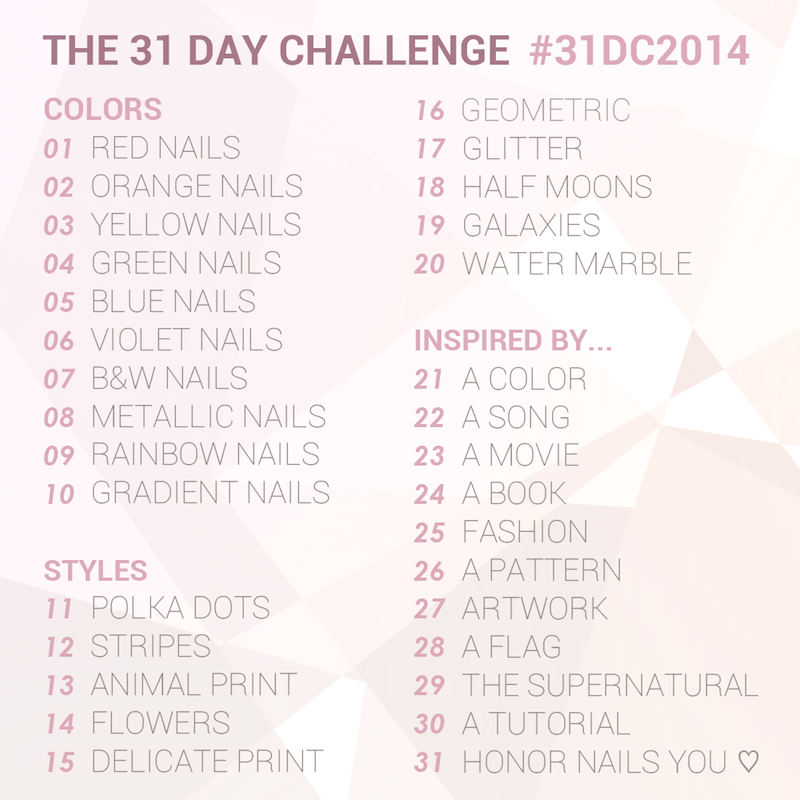 Sinful Colors – Why not? This is 2 coats with no topcoat. it has a good formula and opacity but it is a stainer (as you can see on the cuticle of especially my ring finger). It comes off easily with a good wash but it isn’t ideal. 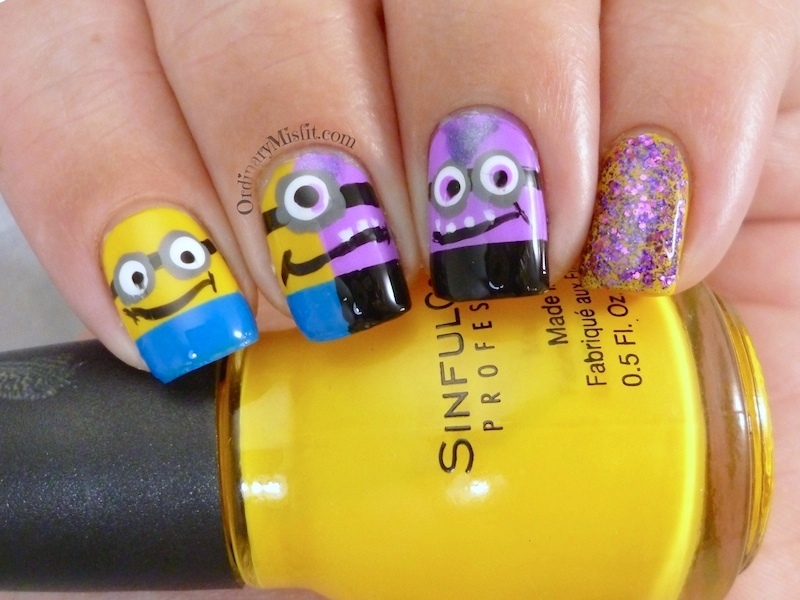 What do you think of my Despicable Me 2 nails? Did I capture them well? EXCELLENT DEPICTION! I love their lil mouths! So cute! Ag cute man! These are adorable! These are so awesome! 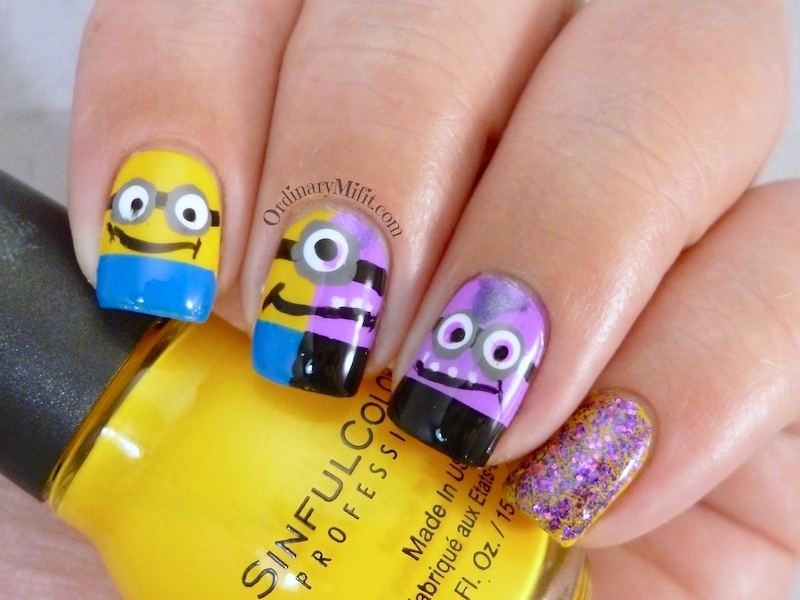 I LOVE Minion nails! These are NOT an easy way out, haha. Adorable!